Citizens of Randolph County derive many benefits from farmland: clean water and air, plant and animal habitat, fresh fruits, vegetables, meat and dairy products, horticultural products, and scenic rural vistas. However, farms are daily being threatened by urbanization. Many residents are moving into rural farm settings and do not realize that farming operations are 24 hour a day enterprises. In addition, to early morning or late evening noise, farmers also receive complaints about odors, insects, and dust. Many farmers have faced nuisance suits filed by their uninformed neighbors. The Randolph County Board of Commissioners passed a Voluntary Agriculture District Program in 2004 to encourage the preservation of farmland, help protect open space, and to provide farmers protection from nuisance suits. In February 2007, the Randolph Commissioners added an additional level of protection for farmers/landowners by creating Enhanced Voluntary Agriculture Districts, which prohibits non-farm use or development of the land for an irrevocable period of 10 years. These Voluntary Agriculture Districts work to promote agricultural and environmental values and the general welfare of the county by increasing identity and pride in the agricultural community and its way of life; encourage the economic health of agriculture; and to increase protection from non-farm development and other negative impacts on properly managed farms. * Is engaged in agriculture as defined in N. C. General Statute 106-581.1. * Meets the size requirements applicable to its class of use as set out in NC General Statute 105-277.3(a) and which therefore requires at least: 5 acres of horticultural land, 10 acres of agricultural land, or 20 acres of forestry that are in actual production. * Be participating in the farm Present Use Value Taxation program or is otherwise determined to meet all the qualifications of this program set forth in G.S. 105-277.3. * Be certified by the Natural Resources Conservation Service as being a farm having a conservation plan and if more than 20 acres of forest on the property have a forest management plan. * Informs new landowners of farm presence and potential of dust, noise and smells associated with agriculture possibly reducing conflicts between neighbors. * Requires that farmland be used as a last resort if land is considered for a public project that may condemn land. * Land enrolled in the program will not be assessed fees or required to connect to water and sewer service if they plan not to use the service. *Recognition, by signage, telling passersby that the farm owner is committed to an agricultural way of life in Randolph County. 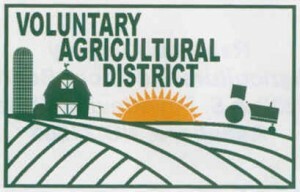 In addition those who sign up for the Enhanced Voluntary Agriculture District may receive up to 25% of its gross sale from the sale of non-farm products and still qualify as a bona fide farm that is exempt from zoning regulations and are eligible to receive a higher percentage of cost-share funds under the Agricultural Cost Share Program. Finally, for farms participating in a Voluntary or Enhanced Voluntary Agricultural District Program, county records at both the Tax and Register of Deeds offices will show, on their maps, farms which are a part of any voluntary agricultural district. When title searches are done for property purchases, those farms will be identified as neighboring existing farms in Randolph County. This will serve as prior notification to the purchaser that they are purchasing a home or land located in close proximity to an operating agricultural enterprise. An application may be obtained by clicking on the link below or by contacting the Randolph County Center of the North Carolina Cooperative Extension Service at 336-318-6000. Complete the application and return it to the Cooperative Extension office. The Randolph County Voluntary Agricultural Board will review the application for acceptance or denial. If the application is approved by the board, the farm will become a participating farm in the Voluntary Agricultural District Program or the Enhanced Voluntary Agriculture District Program depending on the farmer/landowners preference. The VAD Board meets the second Tuesday of every other month beginning in January.